Carver Elementary School will join more than 20,000 other schools across the country to focus on providing a culture of kindness. Carver Elementary School is excited to participate in The Great Kindness Challenge. Our school will join more than 20,000 other schools across the country to focus on providing a culture of kindness. Although The Great Kindness Challenge is celebrated for one special week, our priority is to convey that every kind act matters, not just this week, but always. We'll provide a checklist of many kind acts to help inspire ideas (click here for the checklist or here for the Junior Edition). To have the greatest impact on our students, we want to engage families in The Great Kindness Challenge. 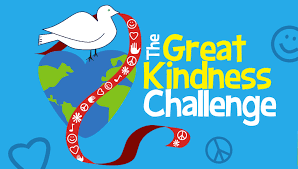 If you'd like, please visit The Great Kindness Challenge website and participate in this special initiative at home. Thank you for helping to create a culture of kindness and compassion in our school. The activities we do during this special week will only emphasize what we strive to accomplish every day, which is to create a safe and welcoming environment for all.